Well, yes, I did buy the damn things. I needed to rip them open for the ride home like tearing clothes off a lover. And goddammit all, I’d been so good for so long! I hadn’t bought potato chips since somewhere in the middle of winter. But here I was, getting my fingers stained red with the blood of my guilt the seasoning of the ketchup chips, then delving into the yellow-coated horseradish chips and not being prepared for the kick that shot back at me through my sinuses — just like real horseradish. I know where this all started, too — the summer of 1983, my first summer out of college, when I was just around the 170-pound mark. I was pretty much living with my first New Haven girlfriend at that point — that lasted a few months — and I would stop at the convenience store/gas station near her place and pick up a bag of Ruffles Sour Cream & Onion and, if feeling deeper cravings, a box of Entenmann’s chocolate chip cookies. And thus an addiction was born. It became a habit, one I didn’t break until the beginning of this year, well after I had gone from skinny young thing to Jabba the Hutt. And I would seek out exotic flavors wherever possible. The usual sour cream & onion and barbecue weren’t good enough after a while, especially the extremely bland Lays varieties. The regional flavors were always the best. My all-time favorite flavor was one I had just once. In 1988, I was sent to cover a golf tournament in Sandwich, England, and was staying in a B&B 45 minutes up the A1 in Canterbury. On the way back one afternoon, I stopped at a Texaco to fill up the rental, and the shop had bags of Golden Wonder Worcestershire Sauce-flavored crisps. I can eat just one — bag, that is. But it was the right bag. And the flavor never left my memory banks. For years after, I would sit at the Anchor in downtown New Haven and occasionally shake some Lea & Perrin’s into a bar bag of Ruffles and enjoy a messier, soggier version of what eluded me. Coming in a close third was New England Clam, a brand made by a regionally legendary snack food company. State Line Potato Chips, based across the Connecticut border in Wilbraham, Mass., was ubiquitous in Southern New England grocery stores — even more prevalent than the scourge of Frito-Lay — until the late ’90s, then vanished. 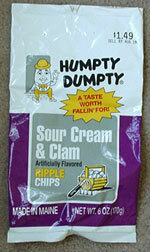 And in the mid-’90s, their New England Clam was right up there, just a notch below Humpty Dumpty. So as I write and you read, you can see the problem emerging, right? I’m writing about these junk foods with a fondness some people reserve for lost loves. It’s pathetic, really. But as I ventured further into my spiral of depression from the mid-’90s through the entire ’00s — and my depression noshing — I would be picking up bags of chips every couple of days. The store would be different (Stop & Shop back home, WinCo or Food Maxx here) and the flavors would be different (I discovered the joys of Granny Goose Sour Cream & Onion, out of Oregon, and California Earthquake Chips out here), but the M.O. would be the same: Feel down, go out, buy a bag or two of chips, some sour cream and dip, maybe ice cream, too, and drown my sorrows. And get big. And develop sleep apnea. Then repeat the cycle. As mentioned in a recent post, the hormone replacement therapy I’ve been on since April with my gender transition has curbed almost all of my depression noshing. It’s brought me a sense of emotional balance I really hadn’t felt before. But I’ve been a sea of storms lately, thanks to the prolonged unemployment, which hits the year-and-a-half mark this coming Saturday. And that, combined with seeing the bags of Herr’s, was enough to send me back into the arms of my old lover. Well, for one night. I think. I left most of my two bags of chips sitting to the side of this here desk in my room as I carried on with my laptop ways. Occasionally, I would reach over and pick up one or two chips, but I had it under control. Until the next morning, after breakfast. I was back here writing and perusing the Web, blindly reaching down for either flavor. And while I got the ketchup chip craving out of my system by that point, the horseradish chips were crying out loud and clear. Plus, putting this much of my life on a blog, in the public eye, where people can call me on my transgressions, should be enough to keep me in line, right? I mean, how credible a writer can I be if I can’t walk the talk? And besides, was it as good for me as it was for Her(r’s)? One thing I’ve learned about my longtime relationship with food is that it never loves you back the way you love it. It’s not a fair playing field. It took me decades — and the hormones — to fully realize that. And did the chips really taste that good? Really? Basically, they tasted like dried food product with some intense flavor clinging to the surface. The ketchup-flavored chips kinda, sorta tasted like ketchup, but then again not. And the horseradish chips? They were indeed intense, but if I need a horseradish fix, there’s always wasabi, to be spread over something much healthier. So basically, I encountered an old lover and tried to see if the old spark was still there. There was some small spark, as there tends to be when many relationships end, but not enough to rekindle the old romance. I’m really not feeling it. I’ve moved on with my life and I’m a much better, happier person for it. Maybe I’ll run into Mr. Chips at a holiday party or other special occasion, say hi, get into a little small talk, but the relationship is over. So I placed what was left of the two bags in the trash. And as my penance, I went out and did 17 miles on the bike. And felt pretty damn good about it. This entry was posted on September 5, 2010 at 11:23 am and is filed under Gender. You can follow any responses to this entry through the RSS 2.0 feed. You can leave a response, or trackback from your own site. I am impressed w/how much detail you devoted to chips for so long. OMG, Herr’s Horseradish Cheddar seduced me, too! The first bag was awesome. And didn’t last long. Actually, I take that back. The first chip was disgusting. Until the familiar, wonderful sensation of horseradish hit the back of my throat. The second one was better. By the end of the bag, I was enraptured. I bought another bag a day or two later. Yummy. I turned a friend of mine onto them. I had a few at her house. Enjoyed them but didn’t over eat. I tried the Creamy Dill. Yum. Liked those too. I almost bought some the other day. I then bought another bag of Horseradish chips again. Maybe I got a bad batch… but I didn’t like them so much the last time I bought them. Too fake. I decided horseradish mixed into low fat sour cream would not only taste better, but be better for me. 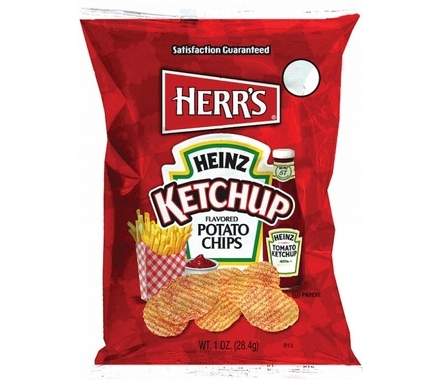 I once really liked Ketchup flavored potato chips, too. But now they are too sweet. My friend served Wavy Lays yesterday, always one of my favorite chips. They were delicious in their simplicity and I ate a handful of them, one at a time, and thoroughly enjoyed them. And then I had a big bowl of salad with my hamburger. Good Job, Fran. It’s great to know that you turned them down because you CHOSE to turn them down, isn’t it? The best thing i learned at Weight Watchers meetings is the fact that when everything else is spiraling out of control around you, the ONE thing you can control is what you put into your mouth. Hi hon. Thanks for the kind words. The thing is, though, I didn’t turn the chips down. I bought them. And indulged. As you know, this is a process. I once pissed off a musician acquaintance of mine, a recovering alcoholic, when I told him that being addicted to food was a harder than being addicted to drink because you can do without drink, but not food. The thing is, though, I wasn’t denigrating his problem. And with my battles with food over the years, I understand fully how our demons can catch us off-guard, at a total moment of weakness. Again, this is a struggle, though not as much of one for me since I started with the hormones. But I do have to remain aware. Besides, I don’t want to throw away the progress I’ve made so far. Hey Fran, yeah, I have always thought that food addiction or shopping addiction must be harder (at least in some ways) than drug addiction or alcoholism…because you can’t completely stop eating or buying (clothes, food, life necessities, etc). Those are 2 things you have to do…and there must always be this constant struggle to keep a balance…am I eating or buying too much? Did I really need to eat this? Did I really need to buy that? With alcohol, as hard as it must be for an alcoholic, at least all they have to concentrate on is simply staying away from it altogether. Which I know is not easy by any means. But you can’t stay away from food. It’s a necessity. And even if you say, “I will at least stay away from bad, unhealthy foods”….well, it’s getting harder & harder to really know & trust that anything you eat is really good for you anymore. Even vegetables & fruits are not as healthy as they once were, due to all the pesticides (that are made to not wash off in the rain) and them being grown on vitamin-depleted fields…or in greenhouses artificially. Everything seems to have some kind of chemicals pumped into them. And the FDA is a joke at protecting any of this. Okay, I started to get off on a tangent that really has very little to do with your blog. Anyhow, congratulations at the small victories. They add up.